Welcome to the Search Engine Map. Here you will find all the English speaking search engines the world has to offer*, what type of search engine they are and where they get their organic results from. Search engines have become the web's most useful online tool, they are the glue that holds the internet together. Whether you're on the look out for answers, to learn new things, getting from point A to B, and so much more, navigating the complex web has become simple thanks to search engines. Our access to information has become a critical part of our everyday lives, and as the web continues to expand (now containing over 4.5 billion websites) our reliance on search engines only gets greater. The inspiration for the concept of the Search Engine Map comes from two questions which we are often asked: "What's the difference between the search engines 'x' and 'y'?" and "what 'type' of search engine is that?". We thought the Search Engine Map could act as a useful source to answer these two questions in a clear and unique way. The inspiration for the design came from The Internet Map by Ruslan Enikeev. The Internet Map shows the links between websites on the Internet, whereby each site is a circle and its size is determined by its traffic, and their positions are based on how strong their links are to other websites. As well as some useful information and statistics on each site. Search engines have their own 'spiders' or 'bots' that go out and crawl the web, which is why they are sometimes referred to as 'crawler based' search engines. Using links as humans do to navigate the web, they then index and make searchable the pages they discover. Finally, they rank the web pages in accordance to relevancy and quality. There are multiple factors which determine this, ultimately those with a higher score appear higher on the list. Metasearch engines build on top of search engines by using their organic results. They usually concentrate on front-end technologies such as user experience and novel ways of displaying the information, or providing an extra layer of privacy between you and another mainstream engine. Organic results appear in a list on search results pages and act as the main source of information. On the Search Engine Map the connections between search engines are based on where they get their organic results from. The size of the search engine is relative to the number of metasearch engines that use their organic results. Certain search engines were not included for reasons such as, being a non-english search engine, remaining stagnant for a long period of time without being updated, poor quality with technical issues and glitches, not having sufficient information about who they are (particularly when describing themselves as having a privacy focus), having a history of spamming, being a replica of another search engine and/or pushing an unrelated marketing agenda. Google Web Search API was closed and replaced with Google 'Custom Search'. This is a limited API in comparison to its predecessor, therefore the 'Custom Search' engines were not included. Infospace is the parent company which operates multiple branded metasearch engines. Therefore, we chose to just include Infospace. 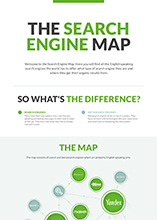 If you have any thoughts or questions on the Search Engine Map, please get in touch at aloe@searchenginemap.com.